it can be paralyzing to think of the damage our daily actions do to mother earth, and instead of motivating us to change, it can numb us into inaction. in order to move forward, taking one small step at a time is the best way to make real, lasting change. i find sites like one small change and sustainable baby steps to be very inspiring, sparking ideas of tiny little positive changes i can make, that when added up over days, weeks, months, years, actually make a dent in my impact on mother earth. my latest change towards reducing my footprint involves transitioning away from drinking packaged tea. babiest of baby steps, to be sure! i have always kept some loose leaf tea on hand, but i didn’t have the right equipment to make this kind of cup of tea as enjoyable as one made with a teabag. i also have favorite tea flavors not sold in the leaf, such as tazo passion, which i drank every morning with breakfast. that meant at least one teabag (filter paper, string, paper tab, metal staple) went into the compost every day, and one plastic-coated paper wrapper went into the landfill every day… and having reduced my purchasing of disposable packaging in other areas so much, the tea bag packaging actually stood out to me. i started by branching out on tea varieties. 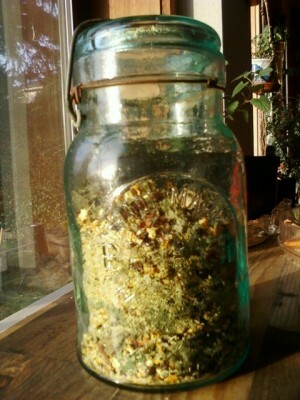 i got some loose leaf organic rooibos and honey bush teas, and also wild crafted several types of tea leaves by drying nettle leaf, thimbleberry and skullcap, and my own garden provided small amounts of lavender, mint, lemon balm and chamomile. 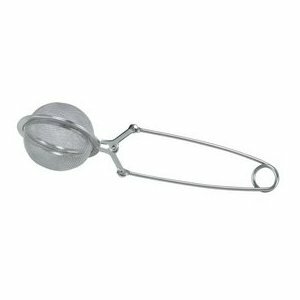 then i added to my equipment collection a little screeny-ball thingie that opens on a spring handle (here’s a picture because i have no idea what they’re called!) 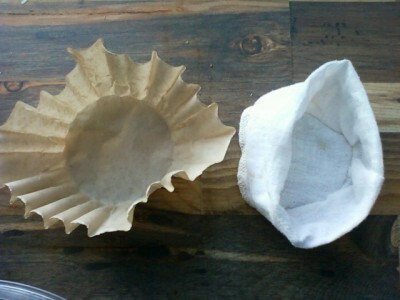 i also sewed some small reusable cloth tea bags from cheesecloth (butter muslin is a good weight/weave). the bags work better for some of the smaller-ground leaves like honeybush and lemongrass. finally, i tackled the task making my own blend of passion tea (i think i’ll call it “inspiration” :)). it was actually a process that took a few months of tinkering. 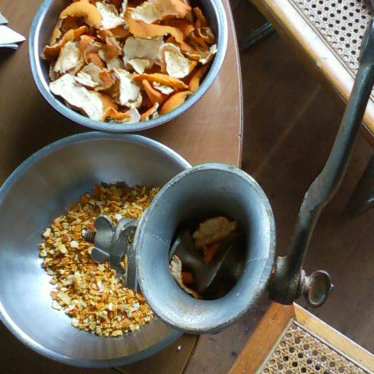 i had been saving citrus peels since last winter, when i decided i was only going to buy organic clementines and not conventional ones- steep price hike, but i knew i could feel better about the tripled cost if i was using the whole fruit, including peel. often i throw a teaspoon of the dried, ground peel into berry muffins, or other baked yummy things, but we weren’t going through it very quickly. i gave it a try as tea, adding in various other ingredients (citrus peel and chamomile is amazingly tasty!) and then i realized that orange peel is a major ingredient in tazo’s passion. the ingredients in passion are “hibiscus flowers, natural tropical flavors, citric acid, licorice root, orange peel, cinnamon, rose hips, lemongrass, and fruit juice extract (color)”. i dropped the “natural” flavors and colors (doh! those are almost always code for something less than desirable for our bodies) and my blend looks more like this: clementine peel, rose hips, hibiscus flowers, lemongrass, licorice root, cinnamon, and citric acid. i’ve also thrown in some nettle and thimbleberry leaves for added nutrition- it’s a high vitamin C beverage, so why not absorb some iron while we’re at it? (iron and vitamin C go hand in hand.) i kept the citric acid, but reduced it to a minor character- it does give it that tangy zing, so i felt it was worthwhile. the hibiscus flowers are delicious and colorful (they make it red, so that part of the passion experience is still there) but they are also far from a local ingredient, so i reduced their prevalence and deferred to the rose hips that can be obtained locally (and some of mine were ones i’d dried myself). we have lemongrass growing in the living room, so that moved up the list- if you can buy it fresh from your local asian market, you can try soaking the stalk and then sticking it in some soil- we had incredible success with this method. licorice and cinnamon are flavors i appreciate in tea in only very small quantities, so i went light on them. our food coop has every single one of these ingredients in bulk, so i was able to supplement what i hadn’t grown/peeled/dried myself. the cost comes way down, as i’ve made it in quart jar quantities for about the same or lower cost than a box of 20 tea bags. one cup takes about 2 teaspoons, so one quart holds enough tea for 96 cups! My tea of choice is orange pekoe – definitely not zero carbon footprint. As for weather I can make it zero landfill…I'd say absolutely. Problem is I haven't found a loose-leaf I like enough. I like a strong tea and all the loose-leafs I've tried have been very weak. Will continue to search though. This is wonderful. I have one of those tea ball thingys, but I also have boxes and boxes of packaged tea. I'm not really a big tea drinker, but I like it for its medicinal qualities, so I like echinacea a lot, as well as many blends made by Traditional Medicinals. I don't have much I can get from my yard, but I could look into getting loose tea leaves. have you tried the chai i sent? that's my favorite!! I've also been buying loose tea from Sunflower Market for awhile now- just seems to taste better 🙂 Celestial Seasonings is a local company for me and i've heard rumblings that they are going loose leaf soon too :)If you ever need a 'taste tester' you know who to send a package to! What a wonderful thing to do … I've never considered making tea, though that's all I drink … hot tea and water (NOTHING else :)). You've motivated me to want to try it though … as soon as I'm settled down. I love the idea of coming up with my own delicious concoction. Oh, I do drink loose leaf tea though … and bagged tea for the convenience … I agree with you with being more sustainable and leaning away from bagged teas ..
We are trying to do this more too.. loose leaf tea. I bought a stainless steel bombilla tea straw.. I just pour the boiling water over the loose leaf herbs in my cup and add the straw and drink straight through the straw that filters the tea for me. You can just keep adding water to the cup over the day until it's weakened. So far, it's straining great, but I haven't tried fine ground herbs with it, mostly bigger leaves. Little steps .. gradual little steps here. Love. ooh i like the air freshener idea!! !